Dehydrated shark cartliage is a healthy and highly nutritious option as a treat for both dogs and cats (for cats it is recommended to break down with mortar & pestle to smaller chunks as some of our customers are already proving works well). Shark cartilage is low-fat, high in Omega 3 and 6 and a great aid for removing tartar and plaque from your pets teeth. 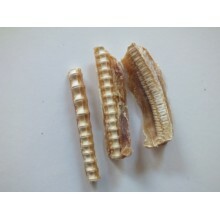 It isn't a long lasting chew but it is a great crunchy nibble which most dogs love. It is also a natural source of chondroitin which is used in joint health formulations and may assist in the relief of arthritic conditions. We have customers using our shark cartilage for their arthritic dogs who are reporting good results with increased mobility & freedom of movement and less pain. This is due to the natural anti-inflammitory nature of our top quality product. Another great asset of shark cartilage is it's ability to help strengthen the immune system - so important for a healthy animal (or person for that matter). Regardless of your pets age or health status, the benefits of a strengthened immune system will always be a great assett to him or her. BM Pet Snax contains only 100% dehydrated premium shark cartilage, air dried at a low temperature to retain all the benefits we've spoke about above. We don't add anything - no sugar, salt, chemicals, preservatives, colour or flavour.